When homeowners are looking to make a change in their home that will lower their energy bills and increase comfort, a popular choice is replacement windows. However, it’s not as simple as that. There are so many window choices, from the glass options to the choice of frame material, and it’s not always clear which choice is best for your Toronto home. Here at Brock Doors and Windows, we realize that each frame material has pros and cons, and these depend largely on the homeowner’s budget and personal desires. In this article we compare fiberglass VS. vinyl replacement windows so you can make the best decision for your Toronto home. Which is the better choice in terms of performance: fiberglass or vinyl? The majority of insulation for your home is made from fiberglass, so it would make sense that a fiberglass window would be more energy efficient than a vinyl window. However, this is just not the case. In reality, the frame material itself is really only a small part of the thermal efficiency of the whole window assembly. A lot of vinyl windows are extruded, and have multiple internal chambers which trap air, or are injected with rigid foam. These elements make vinyl windows much more energy efficient than fiberglass windows as whole. The majority of a window is made up of glass. Therefore, glass options and the available upgrades will end up contributing better performance and energy efficiency than the frame material. Well-made vinyl window frames that have Energy Star-rated glass, will typically be much more energy efficient than any fiberglass window. Make sure to inspect all the window data before you make a decision to ensure that the comparison is accurate. Relevant information to analyze includes the U-Value, SHGC, and R-Value. Quality vinyl windows will offer a good defense against harmful UV rays. These rays are not only harmful to people, but to interior furnishings like carpets, furniture and paintings. The good news is that new vinyl replacement windows have special glazes and coatings that limit the amount of UV rays that can penetrate the windows. Universally, fiberglass windows will always be quite a bit more expensive than vinyl frame windows. Generally speaking, homeowners can expect the price of a fiberglass window to be approximately 1.5 times the cost of a quality vinyl equivalent. This is what makes vinyl windows so attractive to the homeowner on a budget. And don’t mistake the low price tag of vinyl to mean that it is low quality. Vinyl replacement windows are just as durable as fiberglass, if not more, and they will last you for years. With nothing but a quick wash now and then they will stay looking just as good as the day they were installed. As you can see, vinyl windows have a lot of benefits over fiberglass windows, and they are an excellent choice for your Toronto home. 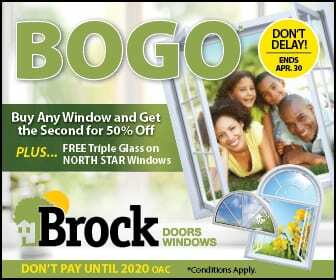 Brock Doors and Windows has been helping homeowners just like you install energy efficient vinyl windows in Toronto for over 26 years. We can’t wait to assist you with your window replacement project! Contact our Toronto showroom at (416)324-2604 or visit us at 2131 McCowan Rd, Toronto, ON, M1S346, Canada.